Posted on March 14, 2019 , in Hot Tubs. Making the decision on what hot tub to buy can seem overwhelming at first, especially for new hot tub owners. With such a variety of features, sizes, and accessories, it can be confusing to know what you should be looking for. Also, even if you have a friend or neighbour that is super happy with their hot tub doesn’t mean the hot tub that they own would be the best choice for you and your family. So, how to decide which hot tub is the best one to buy? Start by understanding what the most important factors of buying a hot tub are. In the article below, we will review what you need to look out for so you can make an informed decision. There is no arguing that jets are one of the most important features in a hot tub. They are largely responsible for how often you will use your hot tub as well as how much you will enjoy your hot tub experience. Often, a common hot tub buying mistake that people make is the assumption that more jets are better. The reality is that the best hot tubs on the market have the right number of jets instead. Industry leaders, such as Hydropool, use cutting-edge jet technology and where the jets are placed is very strategic. You want to make sure that the jets in the hot tub you buy are customizable and that you will able to control the water flow. This is what will make your experience enjoyable and allow you to select the most effective massage programs to target the areas of your body that need it the most. Look for jets that come in a variety of sizes and are changeable as well as upgradeable. another reason to avoid hot tubs promoting the highest number of jets is that these need larger pumps, which will have higher utility costs. Plus, even a large pump will struggle to supply enough water pressure and flow through all the unnecessary jets. In the end, it just ends up feeling like a sub-par massage. The second most important aspect of buying a hot tub is knowing what insulation to look for. This becomes even more important for anyone that lives in a cooler climate and is planning on using their hot tub throughout the year. The type of insulation that your hot tub has is directly linked to how stable the water temperature is as well as what your monthly utility bill will cost. Full foam is a common option in many models. While it is effective for trapping the heat in the water, the downside is that if there is ever a problem and your hot tub needs to be serviced, it can be difficult for a technician to reach the area in need. It can be likely that a portion of your installation will need to be removed in order for the repair to be completed. Hydropool hot tubs are manufactured with industry-leading insulation technology, that was actually inspired by NASA. Called Triple Shield, this technology incorporates a cover, thermal shield blanket, and polyfilm barrier. The waste heat produced by the motor, shell, and pipes is trapped and reused to heat the water. The thermal shield itself has aluminum foil sides which reflect heat back into the water, allowing it to be reabsorbed. On top of being the most energy efficient insulation system currently available, it is easy to service should a problem ever arise. Having a hot tub that is backed by a solid warranty is essential for peace of mind as well as to ensure that you are not on the hook for a ton of money should a repair be required. For any hot tub model that you are considering, ask about the warranty. Make sure that it not only covers parts but labour and servicing as well. Finally, make sure that your hot tub dealer has repair workers in your area. This is often an issue that people run into when they buy a hot tub online is that if it breaks down, there is no one in their region that can perform the warranty repair work. 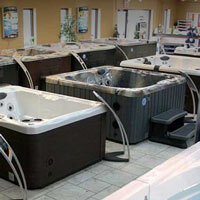 Now that you know what the three most important things to look out for in a hot tub are, it is time to start shopping! Download a hot tub buyer’s guide to learn more about the wonderful benefits of becoming a hot tub owner.